The Operating System (OS) makes your device usable. On a desktop, you will probably use Windows or MacOS whereas on mobile, most devices are powered by Android or iOS. Almost always, the OS is already set up on a device. If you want a bit more control over your device and make them behave more how you’d like, then this page is for you. Click Next Steps for how to put the tips into practice. Looking for specific help with Windows 10? See our Windows 10 tips page for guidance on how to do common tasks in Windows 10 and how to personalise it to suit you. Our guide to using Windows 10 at York. Adjusting the settings on your devices and apps to suit your needs and preferences can make a huge amount of difference. Modern devices, particularly smartphones, can have the illusion that you don't need to organise your files, but we would beg to differ. Keeping your files (and shared files) organised can save time, lower stress, and make work and life easier. Here are some suggestions for keeping your files organised. They may depend on which operating system or storage method (cloud/filestore) you are using. Name files and folders sensibly. These names are how you'll recognise the file again, so they need to describe what it is. On Google Drive this is particularly useful as a sensible name will be easily found by your search terms. Use folders to group related files together in a logical way. When using a non-Cloud storage method (such as saving in your Documents in Windows), folders and files are organised in a tree-like structure that branches off, allowing for related folders to be grouped together in another folder. The file path (address that tells the computer where to a find a file, which looks a bit like a URL in a web browser) will reflect this folder structure. Look at wherever you keep most of your files (e.g. filestore, Google Drive) and reflect on how easy it is to find things. Do you need to use more organisation or name your files more usefully? Keeping your devices and your personal information safe and secure are vital when using technology. This includes choosing a strong password and keeping it safe, protecting your devices with screen locks and virus protection, and looking after confidential data. Keyboard shortcuts are keys or key combinations that provide an alternative - and often quicker - way to something on your computer that you would usually do with a mouse. This Microsoft support page provides all Windows keyboard shortcuts. Likewise, if you use a Mac, Apple has listed all of their shortcuts on this support page. Why not try a few? For more information on Windows 10 keys and shortcuts, see our Windows 10 tips page. Note: The Mac shortcut for locking your computer actually logs you out of your user account. You can also set a Mac to require a password after it is 'woken up' (e.g. when you reopen a Macbook after closing it without turning it off). Try out using a keyboard shortcut or two that you've not used before. For example, many people copy and paste regularly, so try using the shortcuts instead. Or find another shortcut on Microsoft or Apple's support pages (linked above) that suits what you regularly do on a computer. It is important on any device to make sure everything is regularly backed up in case your device is ever replaced, lost or damaged. If you are using a university computer and your personal filestore, the backup service makes copies of this data on a regular basis. It is possible to recover recent files yourself. If you are using Google Drive, your files will be automatically backed up, including data on mobile devices. When using Google Drive, you can also revert to old versions of your documents to recover old versions. You can see and find your Google Drive files on your Mac or Windows computers by downloading Backup and Sync. This tool synchronises your Google Drive files with your computer and backs up other folders and photos from your computer choosing which folders to sync. This method allows you to work on and save non-Google files such as PowerPoint to Google Drive without uploading and downloading them all the time. Taking a picture of all or part of your screen can be handy for a variety of reasons. How to take a screenshot varies across devices and operating systems. Pressing the 'Print Screen' button (often abbreviated to e.g. 'Prt Scrn') on your keyboard will take a screenshot of your whole screen. It won't be saved, so will need to be pasted into an application if you want to use or keep it. 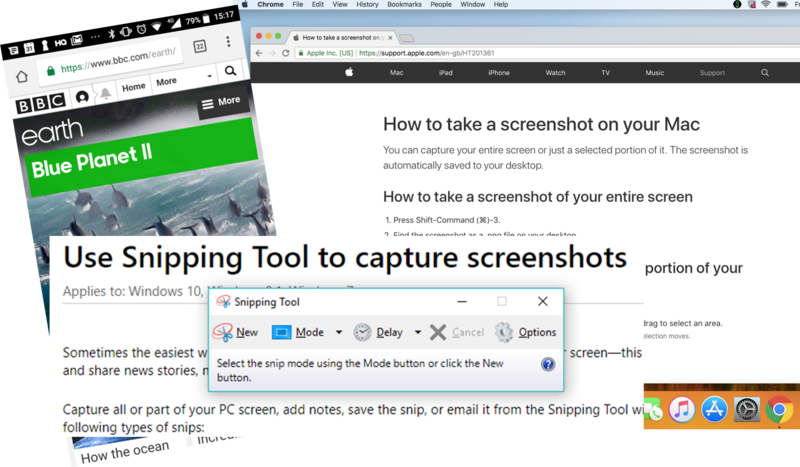 The Snipping Tool is Windows' built in screenshot tool. You can take different sized screenshots and select the active window or the full screen. It also has the option to save the screenshot from within Snipping Tool. There are multiple keyboard shortcuts on a Mac for capturing a screenshot. Shift + Command + 3 takes a picture of your whole screen, whereas Shift + Command + 4 changes the cursor to a crosshair to allow you to drag an area to take a picture of. Both of these will then be saved to your desktop. Hold down the Power and Volume down buttons at the same time for a few seconds to take a screenshot on an Android phone or tablet. The screen will be saved as an image. For more information, see this Android Help page. Hold down the Top button (on newer devices this is the Side button - the one that locks your phone) and then click the Home button. Your screenshot will be saved in Photos. See Apple's Help page on iOS screenshots for more information. Note: on an iPhone X, you hold the Side button and then click the Volume Up button instead of Home.